We got a great response to our jaguarundi special on Extreme Wildlife Radio. In case you missed it, Terri Werner and I interviewed Jim Broaddus with Bear Creek Feline Center about these mysterious and uniquely beautiful cats. I just got an email from Jim with the photo below attached. 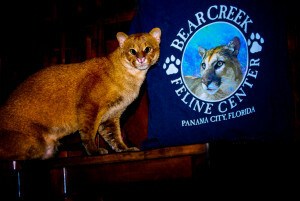 It is “Yoda”, a 12-month old jaguarundi, present at his facility. We’ll explore much more on these cats this year.